Colombini manufatti is one of the many studios you can find in Isola, the district behind Garibaldi metro station and its new skyscrapers. To find it, you need to get inside an inner courtyard of an old “casa di ringhiera”, a typical Milanese house with all the entrances aligned alongside a common balcony. 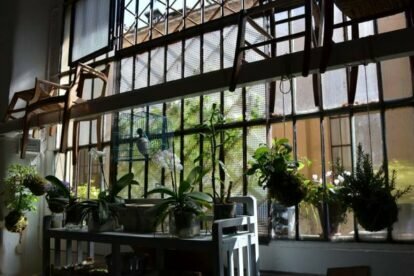 Don’t be shy, I know it seems like a resident only area, but if you walk till the inner courtyard you will find a Master Luthier, a photographer, a stylist, a temporary exhibitions area and this lovely studio, where once you come in you’ll immediately feel at home. The owner is an artisan and interior designer that loves to work with materials: wood, fabrics, iron, paper. She mainly uses old objects and reinvents them making them vintage, industrial, Scandinavian or country style. You can find her building a new table from pieces of one or more old ones or painting a fabric she will use for cushions, lamps, boxes. This is the place I go to when I want to buy a present for my home-design-lovers friends or when I feel I want to change something at home without spending a fortune.